B2B buyers want the B2C ecommerce experience. But what they all too often get is "Shopping Agony." We explore ecommerce features and functionality that can be used to create a consumer-like experience for B2B buyers and ultimately drive more sales. Hello and welcome to the latest webinar from Essent. Today we’re going to take a look at how to create the consumer ecommerce experience that business buyers want. Specifically, we’re going to look at 10 consumer Ecommerce tools that can be used in business Ecommerce to improve the experience. And with that, here to bring you a closer look at improving ecommerce is your presenter, Chimaine Shadd. Chimaine is a sales coordinator for Essent. And she’s also a specialist in the promotional products industry. Chimaine is going to tell you more about how to improve ecommerce to drive more sales by giving business buyers the experience they want. In today’s webinar, we will be identifying and highlighting some of the areas that B2C ecommerce is doing successfully and WHY it should be applied to the B2B shopping experience to achieve the same results. Let’s take a look at our First Tool: Deals and Promotions. Deal and Promotions play a big part in the success of B2C eCommerce because they’re ubiquitous in almost any B2C shopping experience. Ecommerce websites and business management systems need to be capable of generating, processing and tracking various promotions from start to finish. This might include: A percentage off to bring buyers in, whether it’s right off the bat or triggered by a certain spending amount. Free shipping, again right off the bat or triggered by spending. And quantity-based pricing. The most common example is Buy One Get One Free. But business ecommerce often deals in volumes that lend themselves to more nuanced price breaks. Such as a price break at 500 units, or a price break for Unit A when you buy so many of Unit B. But that’s the easy part. The more difficult part is managing the promotion all the way through the order lifecycle. It needs to be reflected in the quoting phase. Then in order processing. Then again in shipping. And again in invoicing. And finally in accounting. Integration is going to make this management much easier. 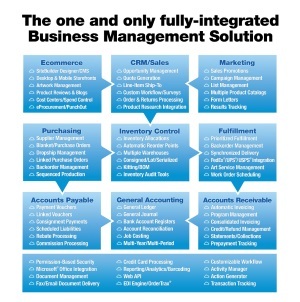 Specifically, a company wants to integrate its ecommerce website with its back office Business Management System or ERP. That way, the company can offer the deal on the website. Then it automatically flows into the back office. And not only does it flow into the back office, but once it’s in the back office it can flow through every step of the order lifecycle. Slide 15: 52% of abandoned shopping carts are triggered by shipping and handling costs. To further support the power of Deals and Promotions … Studies show that 52% of Abandoned Shopping Carts are Triggered by shipping & handling costs. So a promotion that reduces shipping and handling costs will increase sales. Slide 16: 88% of consumers would be more likely to shop at a site if they were promised free shipping. 88% of consumers would be more likely to buy if they were offered a free-shipping promotion. Slide 17: Shoppers spend 30% more per order when free shipping is included. Shoppers spend 30% more Per Order when Free Shipping is included! Product catalogs are fundamental to the ecommerce experience. Without something to sell, there is no ecommerce. So improving the catalog means fundamentally improving the ecommerce experience – and making it more like the consumer ecommerce that buyers expect. One way to improve catalogs to fundamentally improve ecommerce is providing product images. When the buyer sees an image of what they want without continued searching and reading, that’s the quickest way for the buyer to get the item in the cart. When it comes to product descriptions, the manufacturer specs aren’t enough. You want keyword-rich product descriptions. They’re people friendly because they present what’s for sale. And just as importantly they’re robot friendly because the keywords make the items easier for search engines to find. Product grouping is important because without it, buyers are forced to wade through hundreds of projects individually. Buyers usually don’t know the exact product they want. But they may know they want writing instruments. Putting them all in a group allows the buyer to search the group for the specific item. Search filtering and sorting puts a fine touch on the catalog experience. Buyers can search only within one group. And they can sort items by factors like price, color, size, or brand. The searching precision provides the ease of use that buyers expect. And once again, integrating the ecommerce website with the back office is the way to make catalogs user-friendly. You can simply manage images and descriptions in the back office. You can group and categorize products in the back office. And you can insert and define searchable factors in the back office. And now just by managing the back office, all of these factors are automatically reflected on the ecommerce website. Like product catalogs, shopping carts are fundamental to ecommerce. So improving the cart means fundamentally improving the ecommerce experience. When we talk about improving the ecommerce cart, we’re talking about removing barriers to sales. Some major tools that can be employed in the shopping cart to remove barriers to sales are Abandoned Cart Notification, Line-item Ship-to, and Guest Checkout. Getting a buyer to place items in a cart is far from getting a buyer to buy In all types of ecommerce, more than half of shopping carts are abandoned – meaning someone picked out items to buy but then never bought them. And they’re not always a dissatisfied shopper. Many buyers use the cart to comparison shop. They fill up a cart to see the total cost. Then they may do the same with similar items on another site. And buyers commonly fill up a cart planning to come back to it later. So it’s critical, first of all, to retain the contents of the cart. There are any number of reasons the buyer might be coming back to it. Then the seller can send a notice to the buyer reminding them of the contents of the cart. Systems can be set up to do this automatically, such as sending an automated email. And companies can even offer a promotion to close the sale. An automated email that displays the contents of the cart and now offers free shipping might be all it takes to convert that cart. What we mean by Line-Item Ship-To is that Item A can ship to one address, Item B can ship to a separate address, and so on. For example, if the buyer needs the shirts to go one place for embroidery and the mugs to go to another place for imprinting, and the pens to go directly to the tradeshow, the buyer can do that. Without Line-Item Ship-To, this can be a big hassle. And it could possibly nix the transaction. To get the items to their respective locations, the buyer is going to need to unpack the cart and create separate orders. And besides being a hassle, this could potentially include extra shipping costs that makes the buyer think twice. Another option is to ship the order to one address, then reship the items to their respective locations from there. Another hassle. Once the cart is full and the buyer is ready to buy, the seller doesn’t want to create this final hurdle to conversion. So ecommerce systems need a shipping engine that can handle this type of nuance for a better buyer experience. Another major barrier within the shopping cart is required registration. Or, put another, way, the lack of Guest Checkout. Studies show that 25% of ecommerce buyers will leave if they’re forced to register in order to checkout. This could be because the buyer is skeptical of creating an account. Or they just don’t feel like punching in all of their data to create an account. Either way, mandatory registration is a barrier that 25% of buyers aren’t willing to clear. So ecommerce systems can theoretically gain 25% more conversions with guest checkout This means not requiring a user name and password. Sellers want to make the guest checkout option apparent, usually in the form of a conspicuous button. And sellers of course need an ecommerce system that supports guest checkout. Another tool to provide business buyers the consumer ecommerce experience is Customer Self-Service. Customer Self-Service is a win-win. The buyer gains convenience, control, and confidence because they can define and configure the items in the order. And the seller saves time and labor because the buyer is already handling all the details. The key to providing customer self-service is an ecommerce system with a built-in Product Configuration Engine. The seller needs to provide only valid configuration options. The seller puts configuration options on the menu, so to speak, and the buyer chooses. For example, this item can be imprinted in these three locations with these color options. It could include options on artwork, imprint location, size, color, and more. This way, the buyer can customize the product. But only within the rules set by the seller. This way, the seller receives a Well-Formed order. It adheres to the sellers rules. It’s complete and accurate because the seller defined the required information and the available options And therefore the order is ready for immediate processing. It doesn’t require any additional work to get started. Our next tool to make business ecommerce more like consumer ecommerce is a visual product configurator. A visual product configurator takes Customer Self-Service to the next level by visually representing the product as modifications are made. With a visual product configurator, a buyer can see the Product Image & Price Change in real-time as they customize a product. This website allows a buyer to Select a Product, Decorate it, and then see a Preview of the Decorated product before they order it. Here’s another example of where a customer can order business cards online, fill in the order information, and then see a virtual preview of the business card before it is printed. Buyers gain the convenience of not just configuring the order, but seeing how the look and pricing changes in real time. Ecommerce is no longer something that happens only on a desktop computer. In order to provide the great ecommerce experience that buyers expect, the ecommerce website needs to provide a great mobile experience as well. The majority of ecommerce traffic is actually generated on mobile devices, like a smartphone. More than a third of ecommerce sales are closed on mobile And mobile ecommerce is expected to grow twice as fast as desktop ecommerce in the coming years. So sellers need an ecommerce content management system that can create a solid mobile experience. This includes Responsive Web Design, where the ecommerce store identifies the size of the device and responds to fit the size. It also includes Adaptive Web Design, where pieces on the website move around, or adapt, to fit the size of the device. And ideally the ecommerce website is capable of both so that it can always provide an optimal User Interface and User Experience. And since we’re talking mobile, it’s a good time to reiterate the importance of abandoned cart notification. More than 90% of ecommerce carts are abandoned. Part of this is that many buyers use their mobile device as a research tool. They compare and research, intending to checkout later on a desktop. So a seller especially doesn’t want to let a mobile buyer forget about a cart. Here, those automatic abandoned cart notifications are critical. Here’s one way product reviews are implemented. The seller can define the survey with the questions and rating system The ecommerce system can then automatically send a survey to people who bought the product. Buyers answer the survey, and credibility is built in because the survey only goes to those who bought the product. And like that, business buyers are getting information that they’re used to seeing only in consumer ecommerce. And this brings us back to our list of tools that provide business buyers the consumer ecommerce experience they want. We discussed … And with that, I’ll turn it back over to Doug who will tell you how to learn more. Thank you very much, Chimaine. Whether it’s business to business or business to consumer, Essent is dedicated to providing great ecommerce experiences in the promotional products industry. Essent supports all of the features and functionality discussed today. You can visit essent.com/B2Becommerce to learn more. There, you can read more about the top 10, find out more about the Essent ecommerce platform, or schedule time to talk with an Essent representative. Again, visit essent.com/B2Becommerce to learn more and about creating the ecommerce experience that business buyers want. Thanks again to everyone for attending today’s webinar: End Shopping Agony for Business Buyers.